While everyday is meatless in my house, I’m always cognoscente of things that can make it easier to be meatless in other households. Today’s fave comes to mind as something that is so easy to make and delicious to boot. 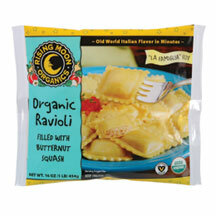 Rising Moon Organics Butternut Squash Ravioli tastes delicious when paired with a simple salad, or as a side for a more ambitious meal. I’ve used some cashew cheese, or a simple butter sauce on my ravioli. I’ve also made a simple roux out of flour, earth balance and unsweetened coconut milk, and seasoned with cinnamon, cloves, nutmeg, salt and pepper for a very fall flavor profile. Just thinking about it makes me warm and fuzzy. ← The perfect stocking stuffer….